View from the bike on the Dave Clark Path: There’s a big new mess down there. 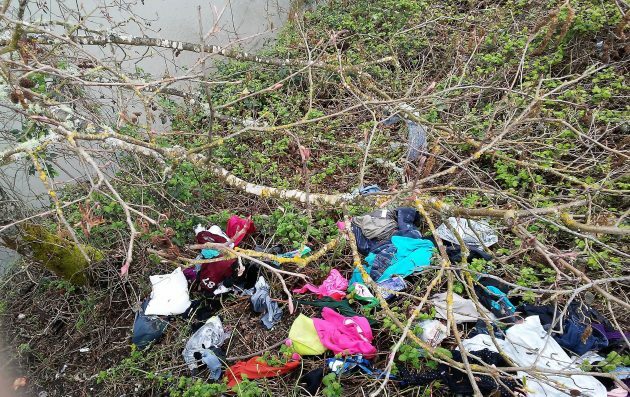 Once again the Willamette riverbank off the Dave Clark Path in Albany has been trashed. This seems to be a regular thing, and the vandals responsible deserve to spend some time in jail. On a ride in January I came across the scene as a city parks crew was cleaning up the bank below the bike-and-walking trail just east of where Jackson Street dead-ends on the river. On Wednesday, another big mess had been dumped at the same spot. Earlier, city officials blamed vagrants camping in the void underneath the concrete path, which is cantilevered over the bank in places. 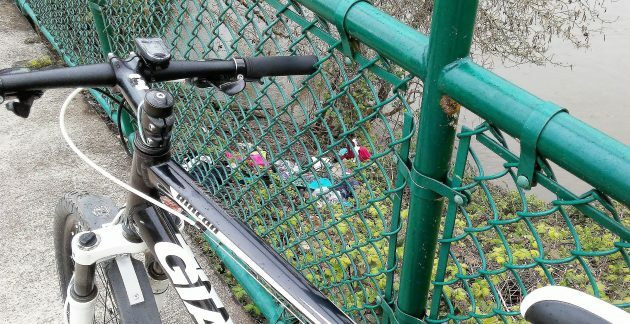 From the looks of things Wednesday — one sock was hanging pretty high up in a tree — it seemed more like someone had just pitched a huge load of trash over the railing of the path. Parks supervisor Rick Barnett told me in January he had a contractor looking into the costs of installing a fence below the path to block the space underneath and make camping there difficult or impossible. But the contractor was unable to do the job and didn’t provide a number for what it would cost. Albany’s small parks crew has enough to do without having to keep cleaning up after people who willfully defile our environment in this way. It would be helpful to catch the vandals and make an example of them by putting them away for a while. Last year, at a cost of $298,008, the city installed new lighting all along the Clark path, hoping to discourage vagrancy and other problems. It evidently hasn’t prevented trash attacks like this. The lights are great and APD has a vehicle to patrol the bike path so the question is how often an d when do they do so. Is there anyway they can have inmates down there cleaning that up?